Hello, beautiful people! Jordan here today with the last post of March! Say what?! I can't believe how fast this month has gone. I have for you today a 3 To Inspire. 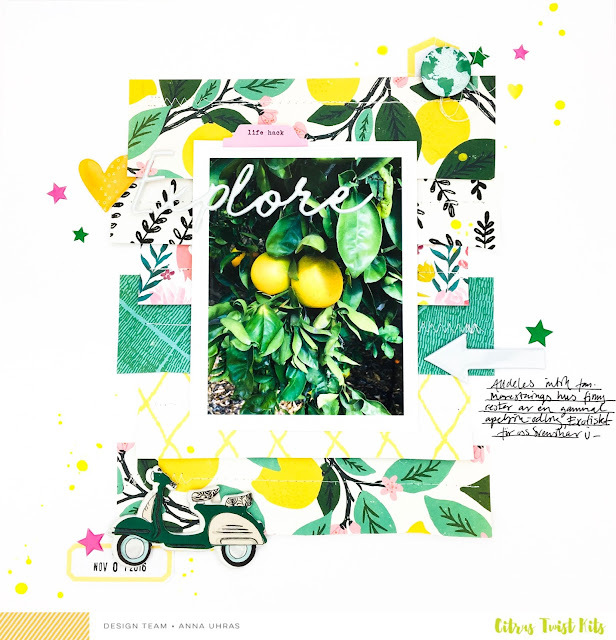 For this project I used the gorgeous, March "Lemon Drop" Scraboook Kit along with the March Embellishment Kit. Unfortunately, these kits are sold out, but I hope you still use these prompts to inspire you to use another of our gorgeous Citrus Twist kits! 1. 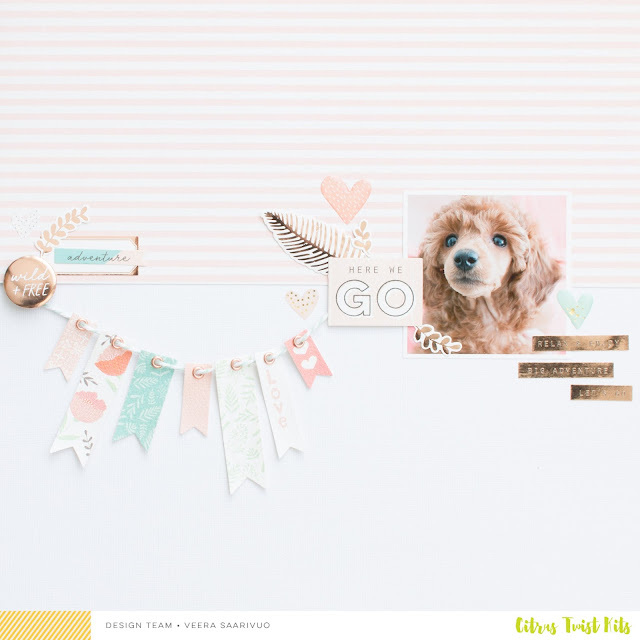 Create a border around your layout by layering a patterned paper behind a solid. 2. Layer! I'd love to see you layer several papers, tags, embellishments, etc behind your photo and challenge you to layer another element, as I have done here with the labels. I really loved the clean-ness of layering a black and white pattern behind the stark white cardstock. This kit is so very colorful and I felt the colors really popped against the classic black and white. Behind my photo I layered 3 papers and two of the tags from the ephemera pack. Layering adds such visual interest and depth to a page and really draws the eye to your photo. Here I continued layering by stacking two of the labels from the cut apart sheet. One on which I wrote the location and the other on which I stamped the date. 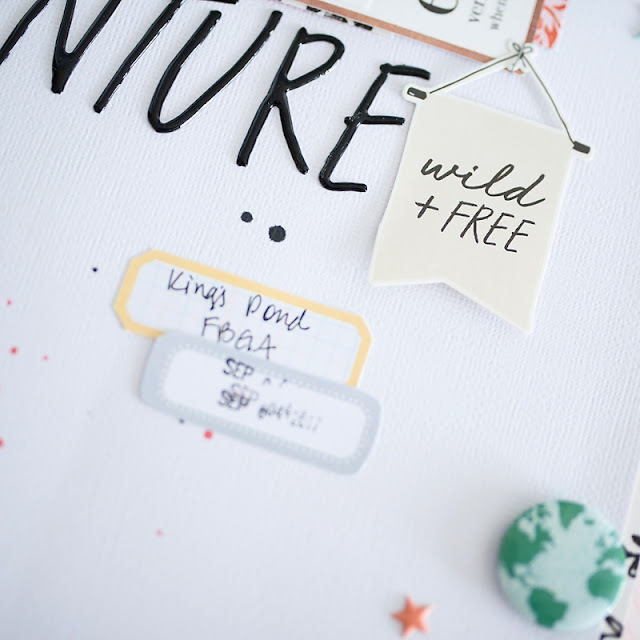 That wild + free banner was a favorite of mine from the sticker pack, so I had to "hang" it somewheret! The flair pack this month was such a treasure! I can see myself using every single one of them on future layouts. Flair is something I tend to hoard, so if you're like me, tear open that package and use them!! 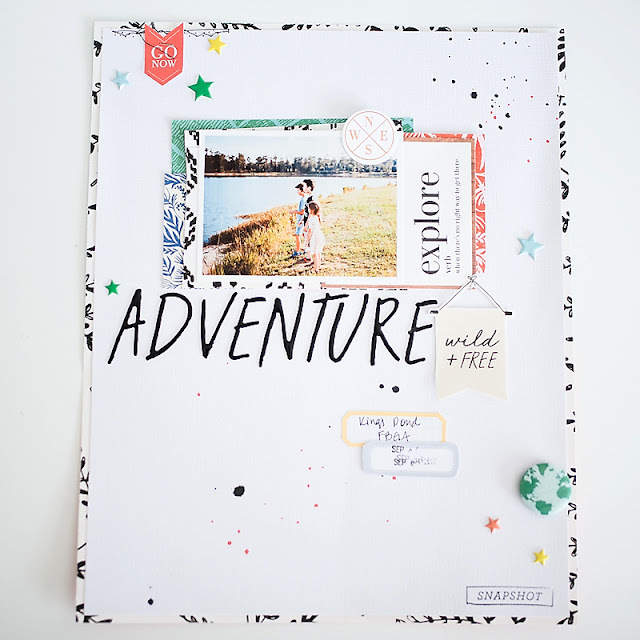 They add great dimension to a page! 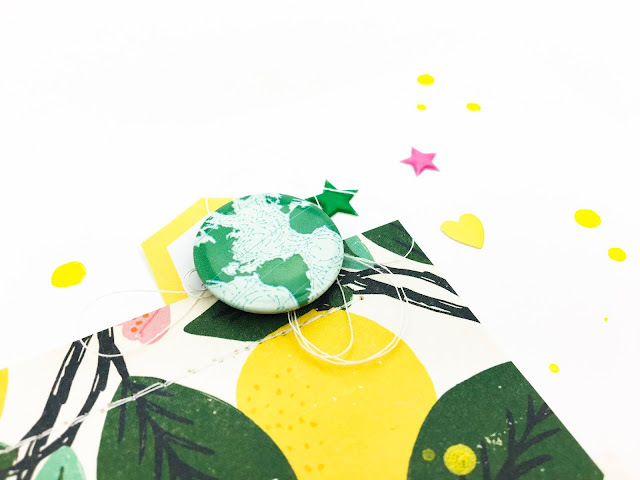 I love that Citrus Twist includes a stamp set in their subscriptions. 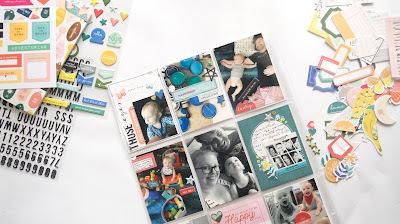 The smaller stamps are perfect for filling in little corner clusters. That's it. I hope this inspires you to create something beautiful today! If you do, please share it with us on Instagram. Don't forget to hashtag #citrustwistkits. Or pop in and say hi over on Facebook. I hope you all have a wonderful and blessed Easter weekend! I hope you've had a lovely week and are ready for the weekend! 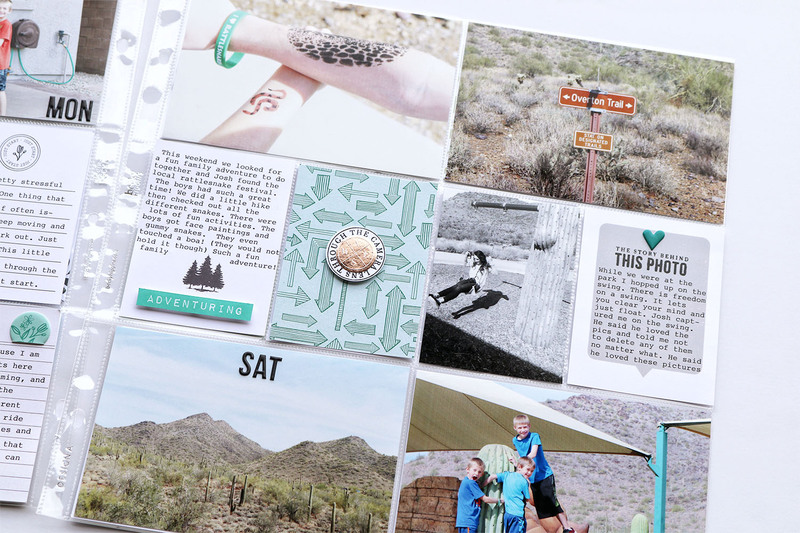 Today I have a little photo-centred PL Challenge for you to help spark some extra mojo in your pocket page process. I love to play with different photo sizes and combinations to create some interest in my pages. I use the Project Life app to create my photo collages. 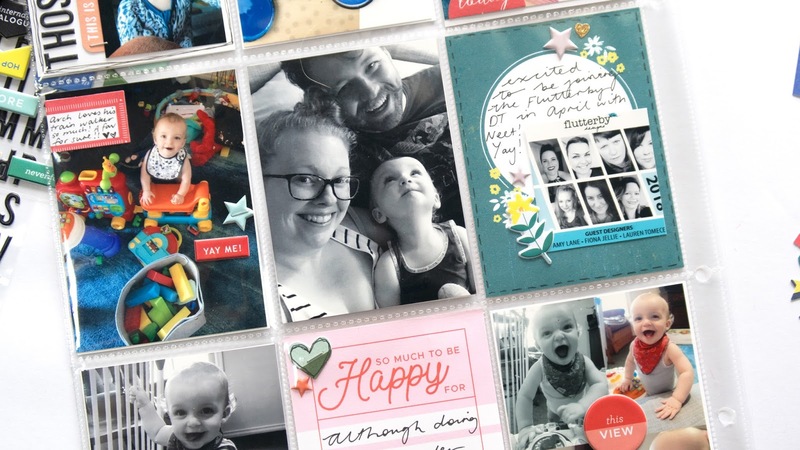 The small embellies included in the PL Kit each month, like puffy shapes, are perfect for adding a little something to your photos. Adding screenshots to your PL is another way to tell the story of your week/month. 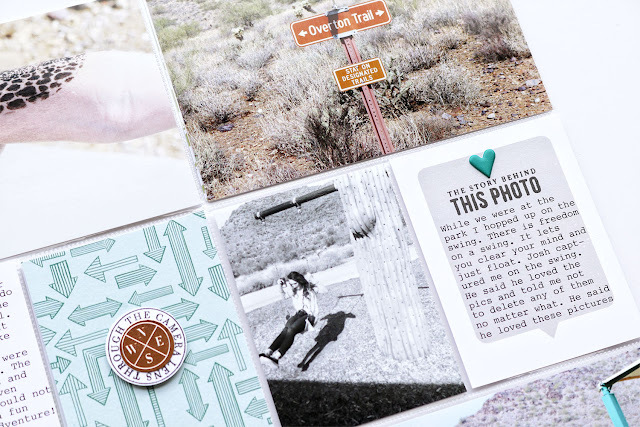 I love to include my friend's posts of their adventures overseas, inspiring quotes I find online, or text messages of funny moments between my family and I. I can't wait to see what screenshots you include this month! 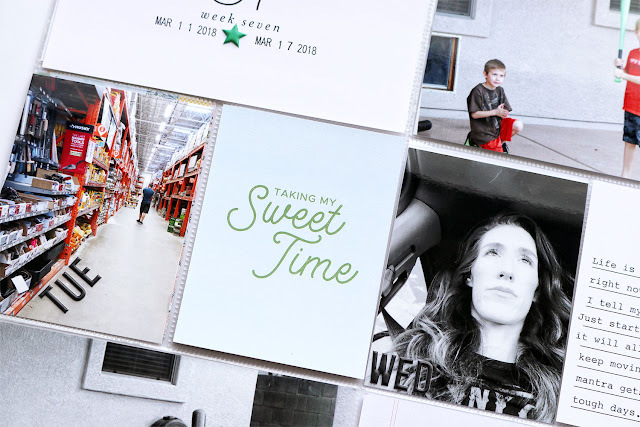 Collages are a great way to combine photos from the same moment. By doing so, you can tell a little more of the story - like here I captured the different faces Archie pulls when he's ready to play chasey. I have recorded a video for you showing my full process! I hope you enjoy it! Hello CTK friends! 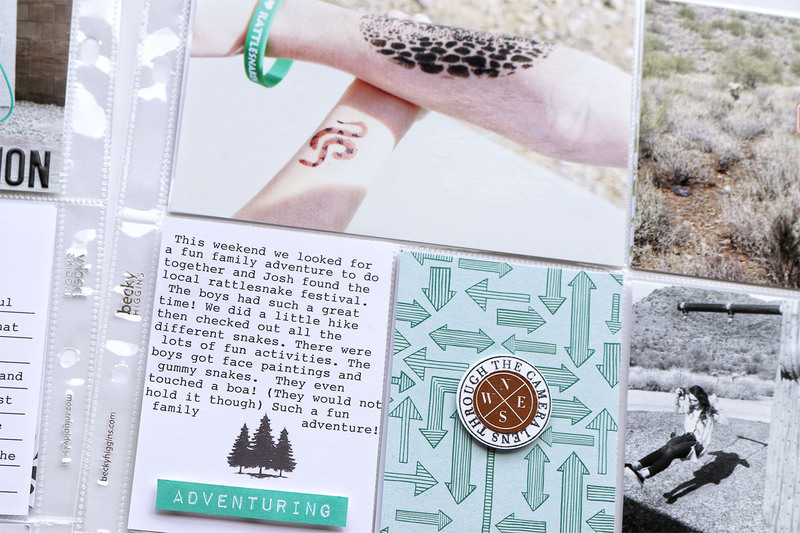 It is full blown spring and I wanted to create a fun traveler's notebook spread to celebrate. I took a fun photo of my little guy going down a big inflatable slide. I loved the look of pure joy on his face. He was SO happy! 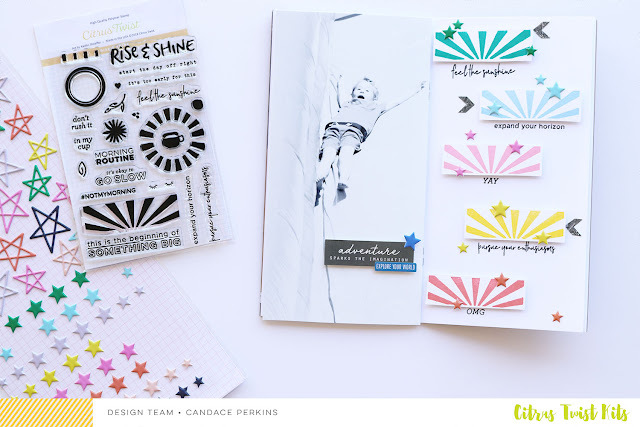 I wanted the spread to be bright, colorful and reflect the joy in the photo. To start the spread I printed a full page photo on the left side. 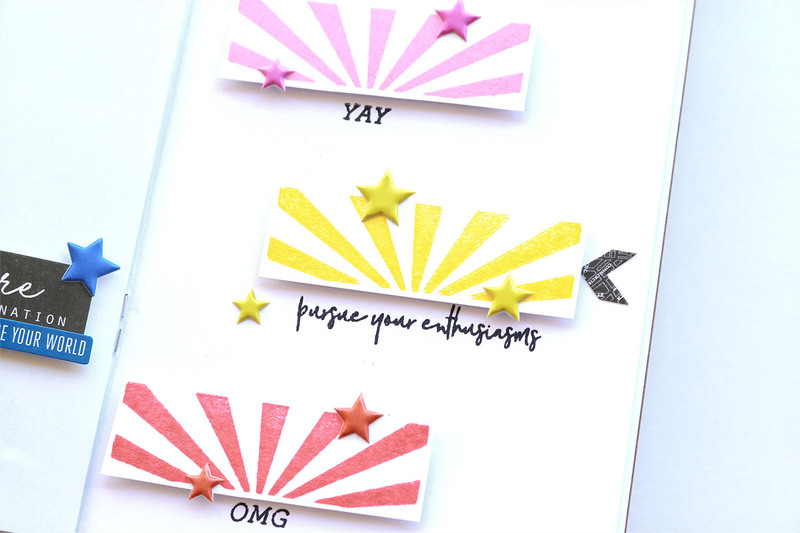 For the right side I used the sunshine stamp and stamped it out in various colors that coordinated with the puffy stars in the kits. 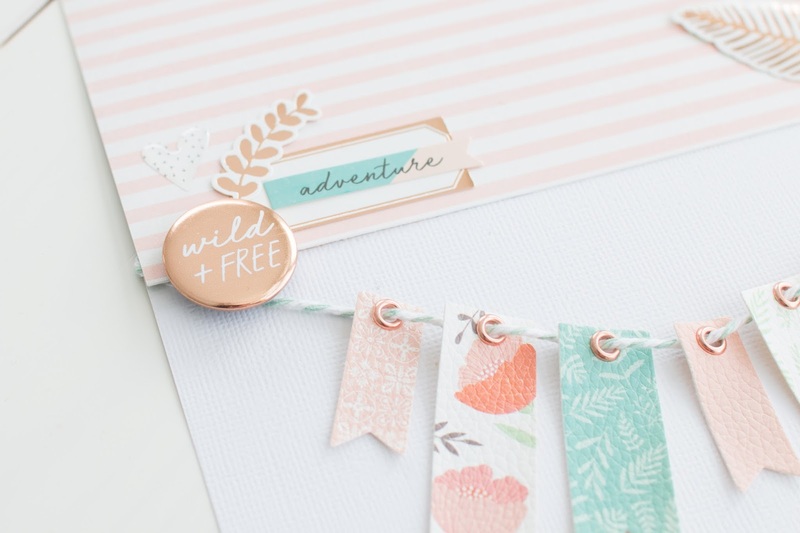 I loved all the sentiments in this month's stamp sets. I used a few sentiments from each of the sets and stamped them under the stamped sun bursts. 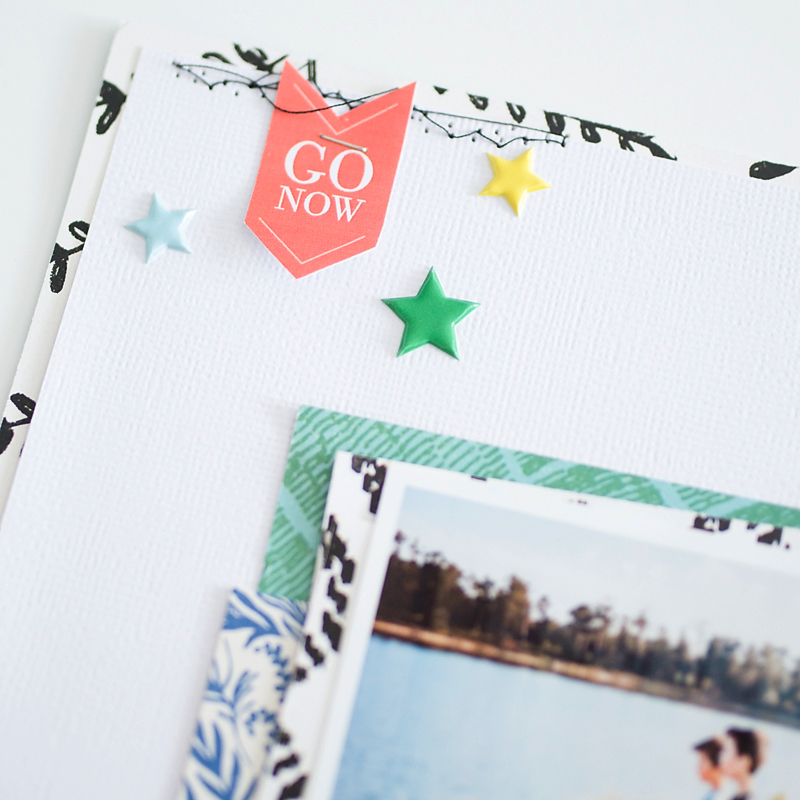 Finally, for the fun embellishments, I added the coordinating puffy stars. I love how cute it looks! How can you get creative with the fun stamp sets this month? 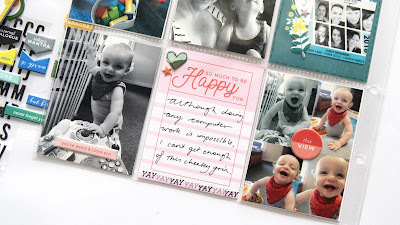 I love how versatile they are and perfect for any of your projects! You can check them out in the new shop! Thanks for stopping by! 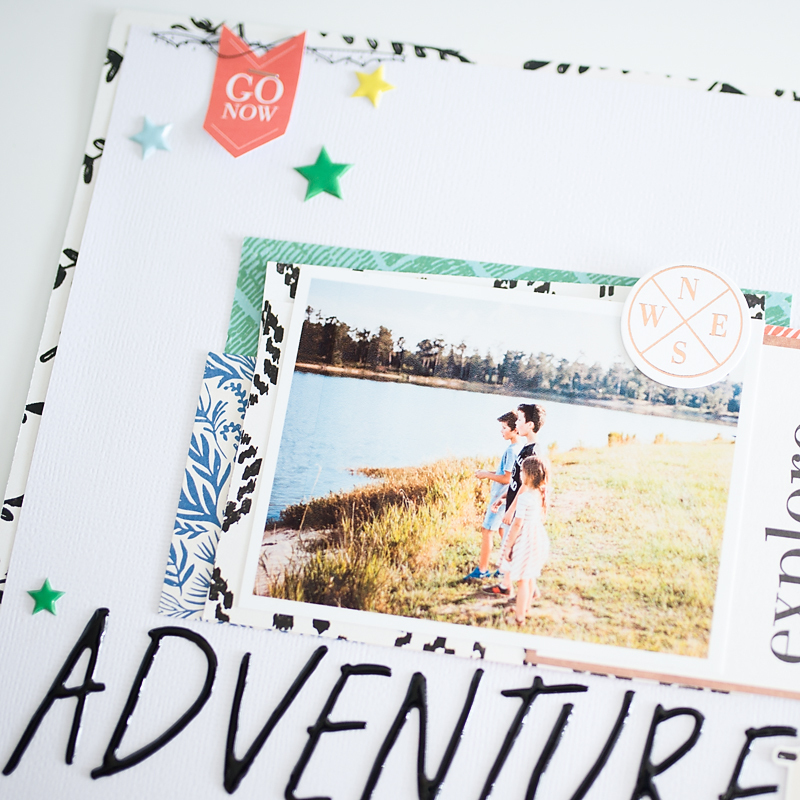 I decided to switch things around a bit this month and started working on my Mexico mini album. This project is near and dear to my heart for various reasons and I'm looking forward in sharing my process and pages with you. 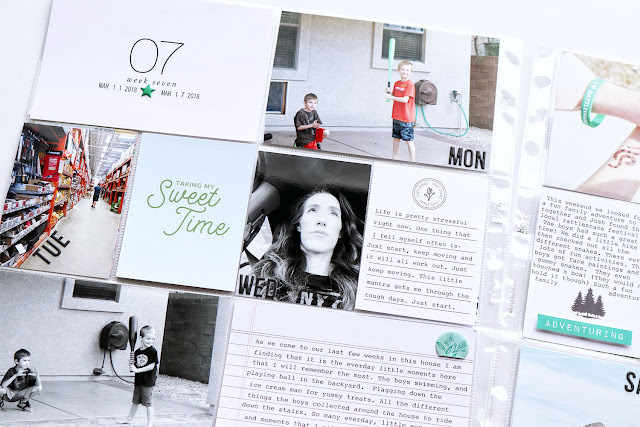 I've always been a fan of the 4x4 format for my mini albums and for someone who's not big on journaling, being able to fill up my pages with a quick blurb or paragraph, is perfect! I recently purchased a vintage Brother De Luxe typewriter at a local Flea Market and this project was a great opportunity to take advantage of my new toy. As you can see, a few errors were made (slowing down when I type, would probably help) but I decided to just go with the flow and chose not to start over, whenever mistakes happened. I decided to use bullet points for my storytelling. First, I created my titles in Photoshop using the Smith-Corona Galaxie Typewriter font, printed them on matte photo paper and then typed in my text using my typewriter. The above 4x4 page was inspired by the wonderful Beshka Kueser. I drew a wonky scallop border with my pencil, at the bottom of a plain piece of printer paper and cut it out with my precision scissors. Having placed my now handmade "stencil" near the bottom of my patterned paper, I then used an old discarded rewards card to spread a dollop of bright pink acrylic paint, from top to bottom, until it covered the exposed pattern paper area. After the paint had dried, I stapled on a label which contains a few details of our pre-trip whereabouts. 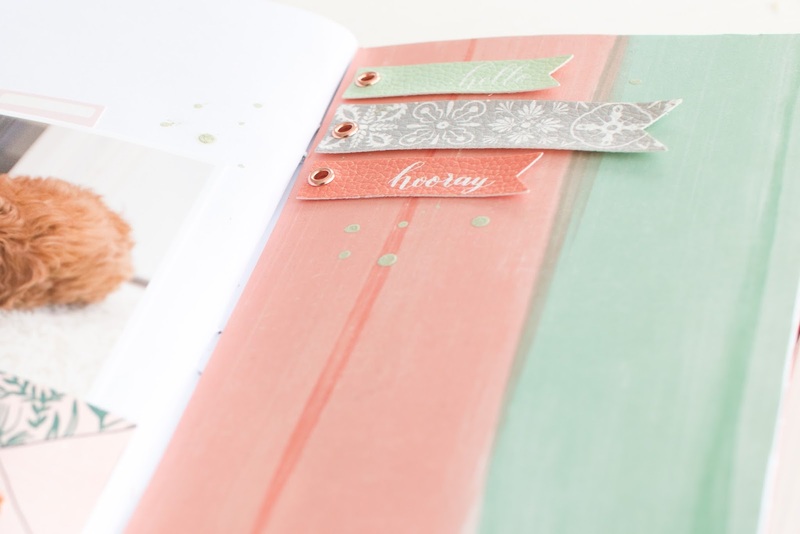 I absolutely LOVE how translucent the paint turned out on my background paper! For the time being, my pages are simply held together by a book ring closure (in page protectors of course) and will be put in a 4x4 album, once my project is completed. Hope you enjoyed and happy creating! Hi friends! 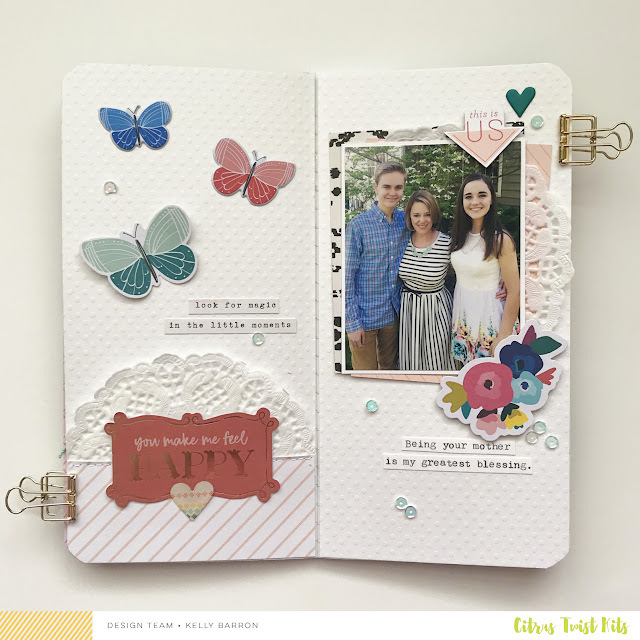 Today I am going to share a TN spread that I created using the gorgeous Pocket Life kit. 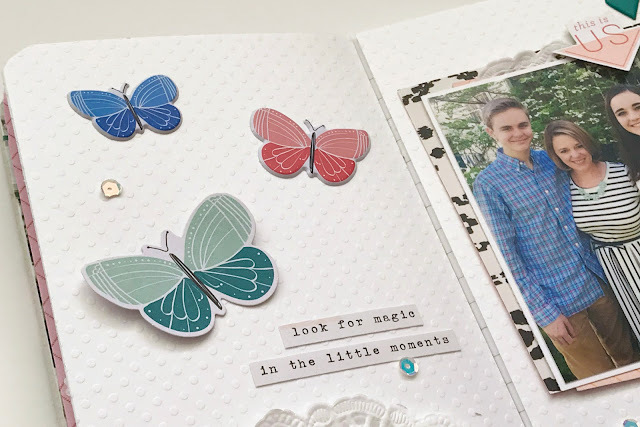 Butterflies are some of my favorite embellishments to use and the ones included in the die cuts and puffy stickers are simply gorgeous. It was an easy decision to create my spread based on these embellishments. 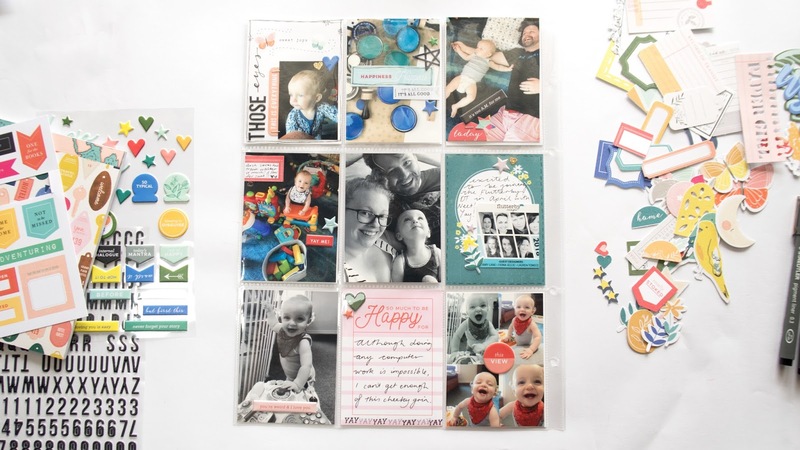 I do not do Project Life, yet I still have a subscription to this kit each month because it is so versatile to use in both my TN spreads and my traditional 12x12 pages. 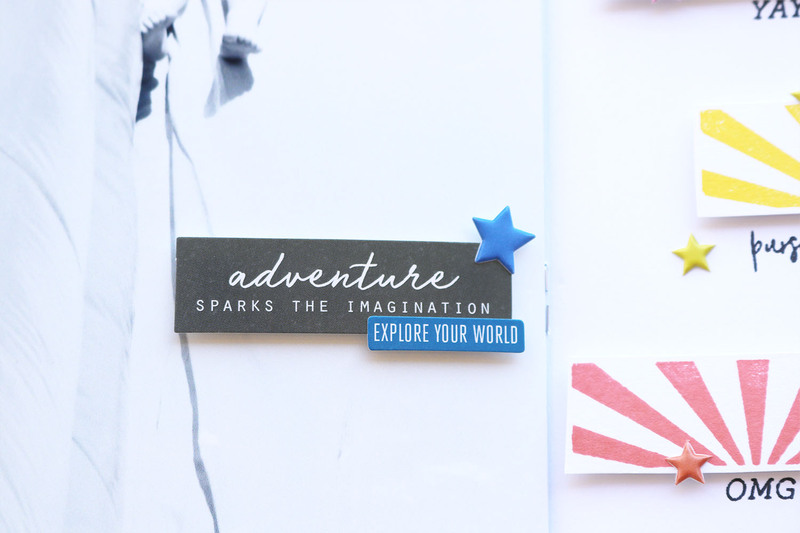 Here is the spread that I created for my Gratitude notebook. The first step for me in creating this spread is to go through the different cards and pull out ones that had colors that were similar to the butterflies. I found three different cards to use, and then chose the rest of the embellishments for this spread. By fussy cutting an image from a 3x4 card, I created a die cut with the "This is Us" phrase. I also used another card to back behind my photo with similar colors. 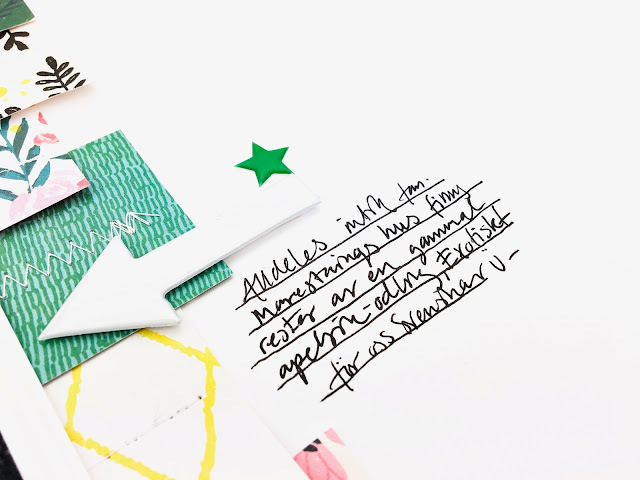 One of the 4x6 cards had a beautiful diagonal stripe and this phrase. 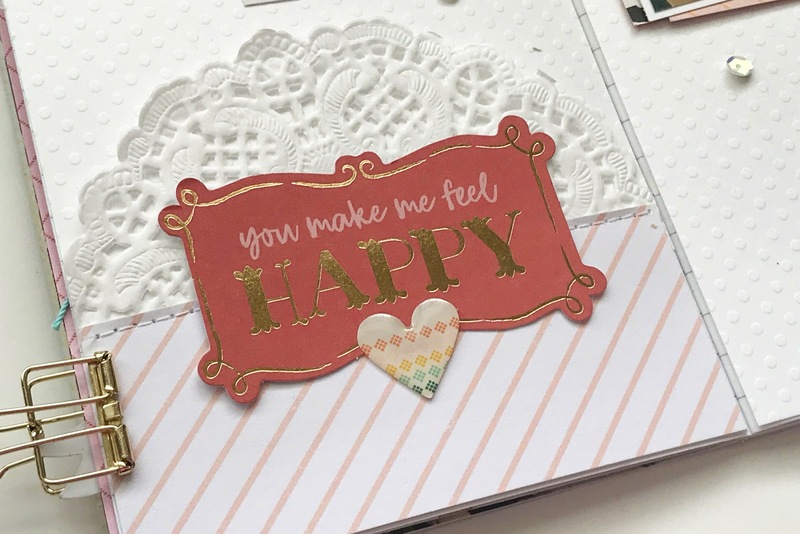 I fussy cut the phrase and then trimmed down the diagonal stripe to create a strip of patterned paper across the bottom of my spread. I pulled the doily from my stash and love the added texture that it brings to the spread. 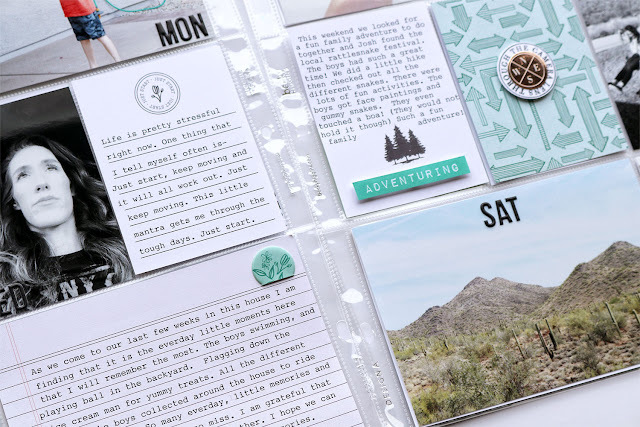 I hope that this inspires you to look at your Project Life cards in a new way. I have linked my process video below. Thanks so much for stopping by and I hope that you have a great day! Hello CTK friends Candace here today to share a fun pocket life spread using the March "Lemon Drop" kit. 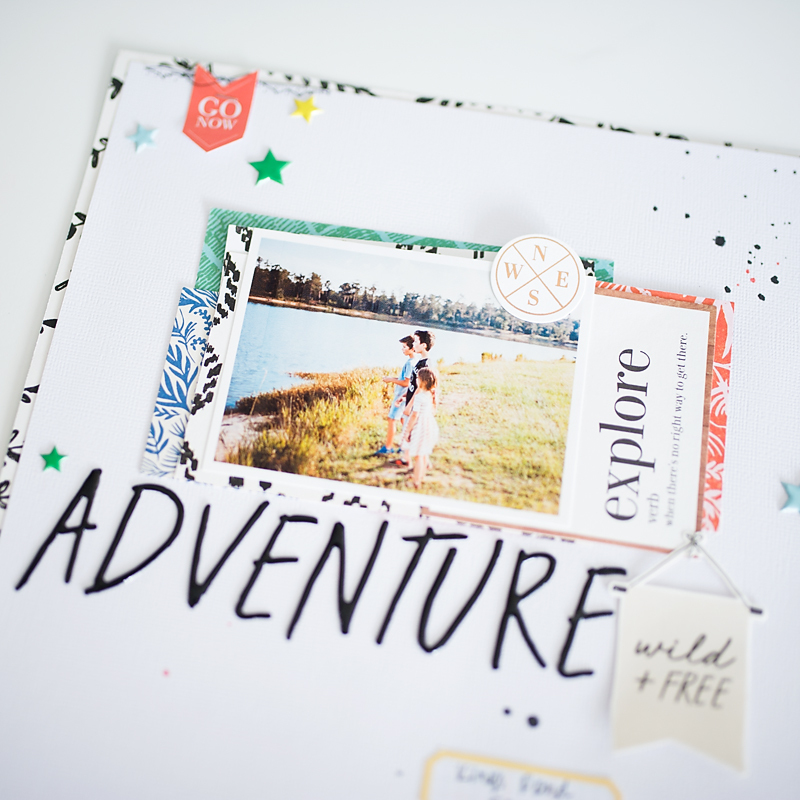 This month the kit is packed with so many fun goodies! 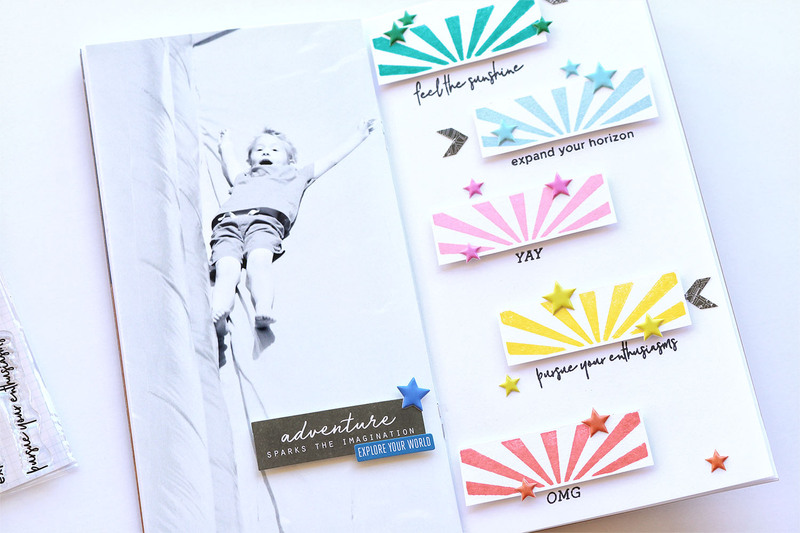 With so many fun embellishments to chose from it helps spreads to come together in a snap because everything looks great! 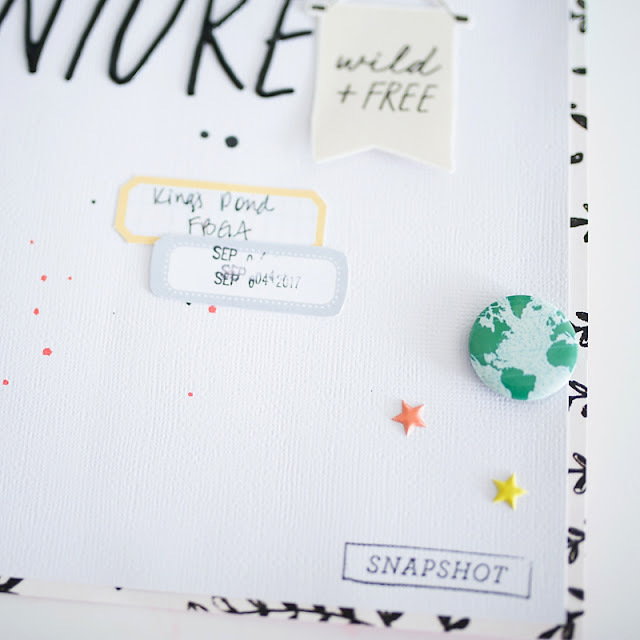 Is'nt it gorgeous, so versatile, You can turn it around, use it for a TN-spread or transform it to a Lettersize layout. Can't wait to see your take on it! This is a very exotic scene for a Swedish girl like me, lol! Ain't these flair just wonderful, love it, and those puffy stars as well. So much to love about these kits for sure. Next two favorites of mine, the white shiny Thickers word and the epoxy hearts. 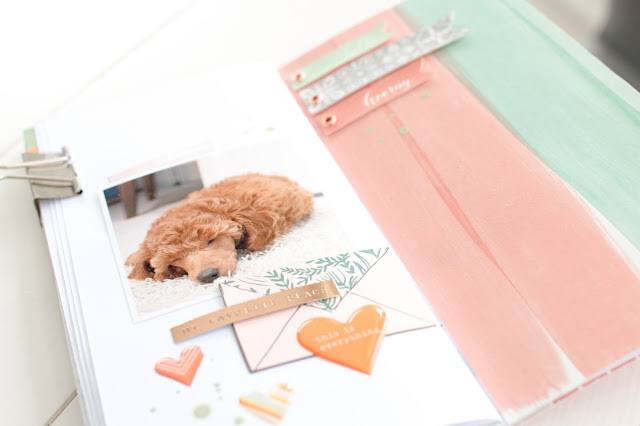 This cute little lable is from the monthly cut apart sheet. 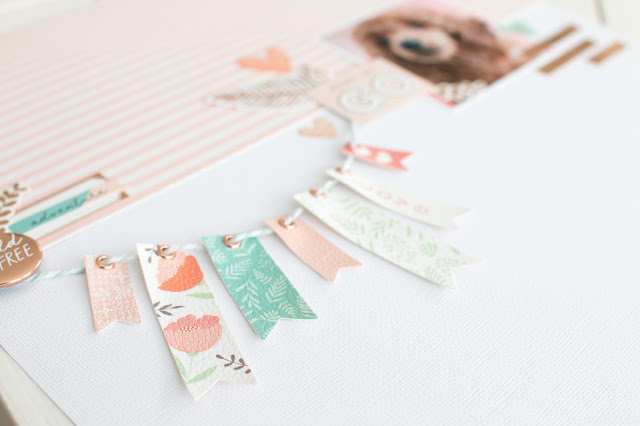 I really really like them, so easy to tuck in under a photo or one of the embellishments like above. It's such a easy way to start up a layout with a sketch. That's one of my favorite go to's when my mojo is low, grab a nice sketch and have fun! Now it's your turn! 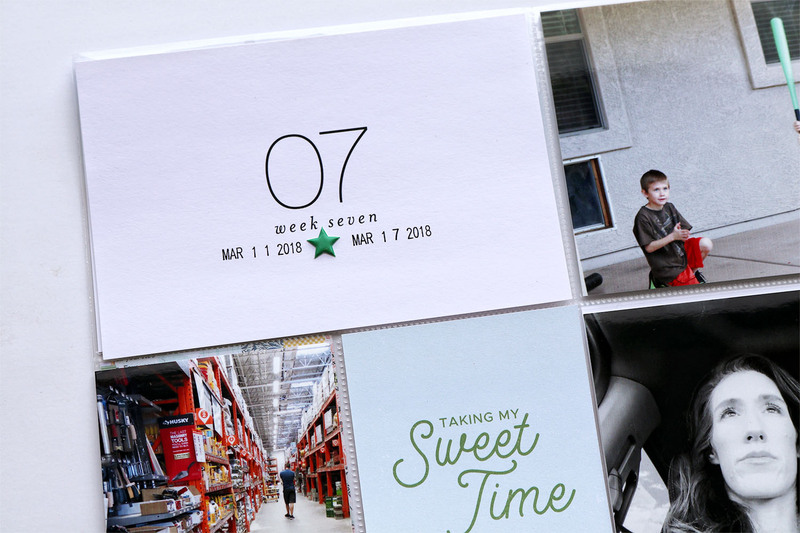 To play along with this week's Sunday Sketch Challenge, create a layout based off of today's sketch, upload it to the gallery with today's date (3/25) in the title, and you are in for a chance to win a $5 gift certificate to the CTK Store! 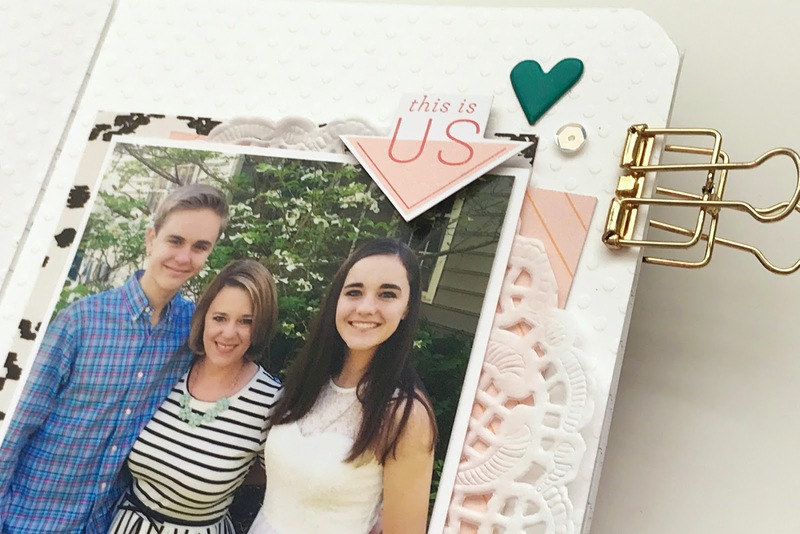 It's time for this week's 3 To Inspire! 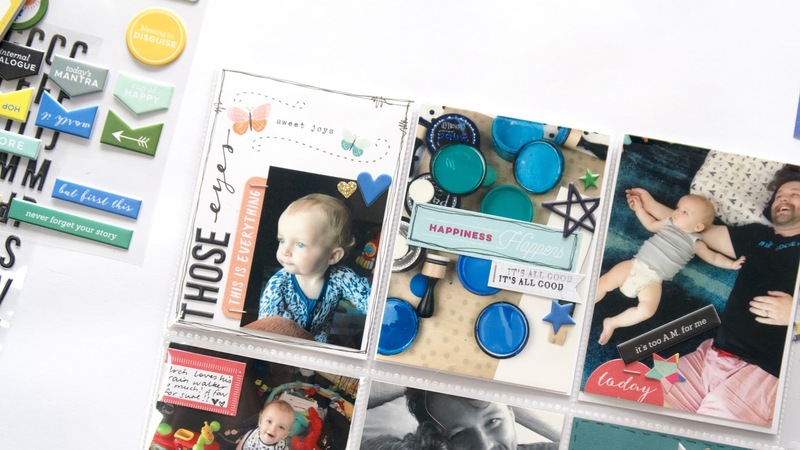 It's Veera here today to share you this weeks' prompts and two projects I made with these prompts using March kits. This time I wanted to show you two different type of projects with the same prompts: 12x12 layout and traveler's notebook spread. 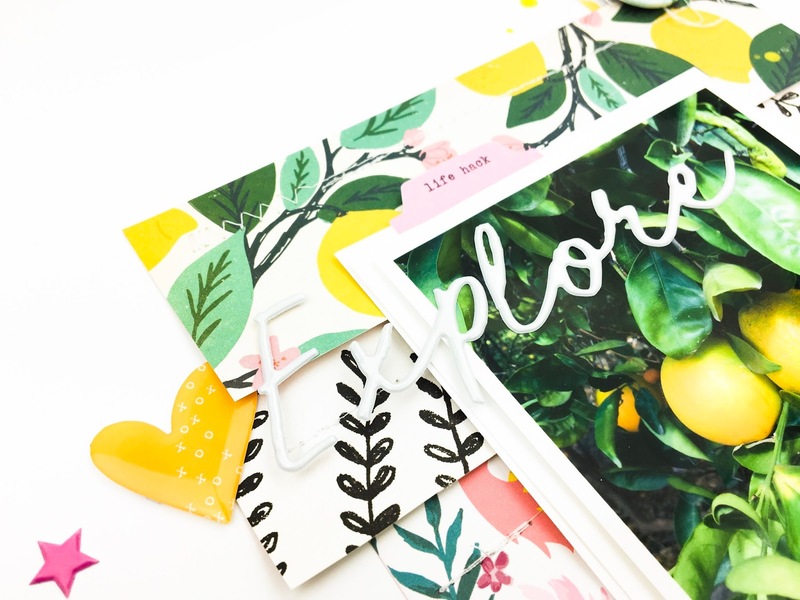 Both of these projects have the prompt "stripes" as a form of pattern paper. 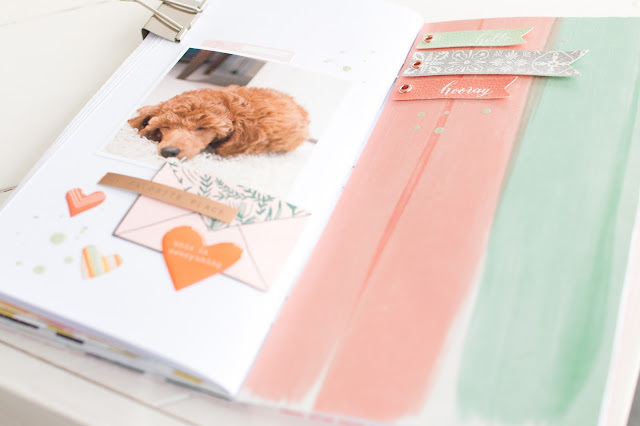 In the layout I used a part of patter paper in the color of white and peach horizontally. The traveler's notebook spread has a piece of pattern paper with from Crate Paper with those beautiful painted stripes. The element with the "tags/banners" is similar in both projects in form of product used. I used the Pinkfresh Studio leatherette tags from March Embellishment kit. For the layout I placed the tags as banner. 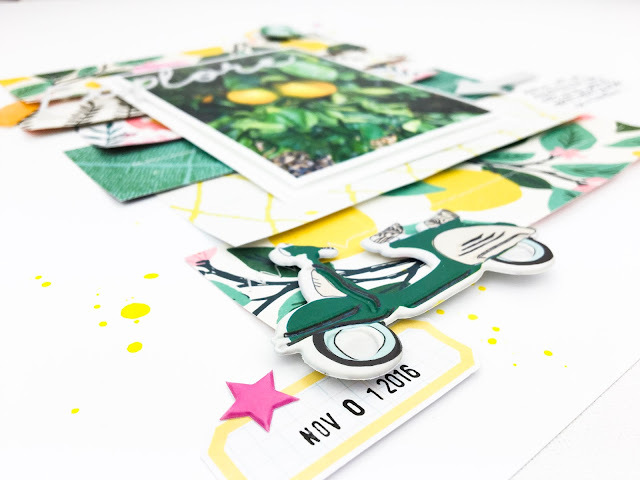 This time "hearts" was a easy prompt as the March "Lemon Drop" scrapbook kit had those beautiful epoxy hearts by Pinkfresh Studio. 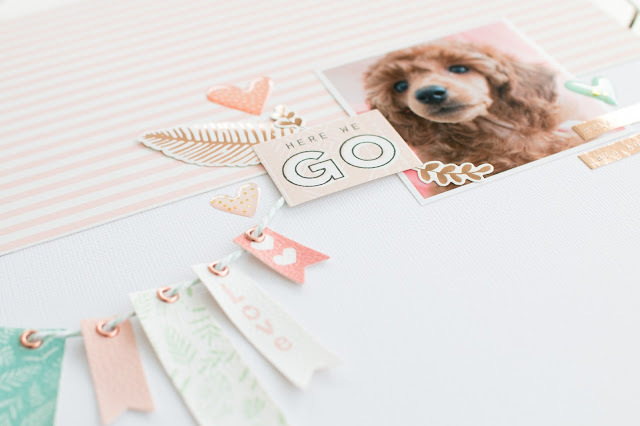 I just love the soft, glossy and stylish effect these hearts add to any project! Now it's your turn to show how you interpret the prompts! If you play along, don't forget to upload your project to the CTK gallery and/or Facebook group for a chance to win a $5 coupon to the store!